CHICAGO – The stage play that Harry Lennix is in town to direct – “A Small Oak Tree Runs Red” – is in its last weekend, and is giving the actor/director the best notices of the theater part in his long and successful career. For more information about the play, and ticket availability, click here. 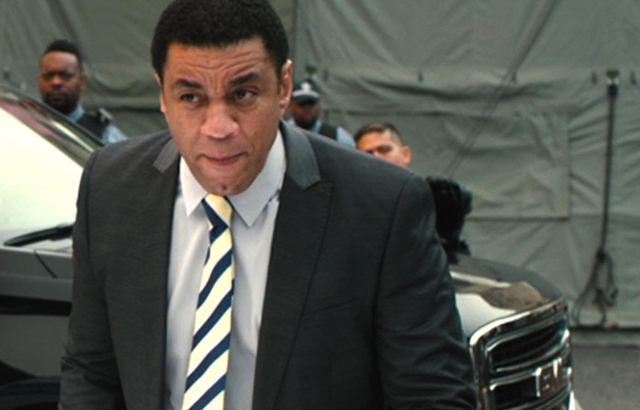 In Part Two of the HollywoodChicago.com interview, Harry Lennix talks about his career as a working actor, and his viewpoint on this unique time in history. HollywoodChicago.com: You’ve been a regular or semi-regular on TV series in three decades of network television. What has changed most profoundly in that particular arm of show business, in your observation? HollywoodChicago.com: How has that multiple platform, multiple screen competition changed the way television is produced, since you’ve worked before the internet became a provider? Lennix: It’s gotten better, but that’s not to say that the early days were necessarily bad. At that time, the competition took place on an earlier part of the supply chain in broadcast television. There may have been great scripts, and perfect actors to fill the roles, but those pilot projects could be stopped at an earlier point. Now, damn near anything can get on the air, but who can get people to watch? There are a lot more choices, even if you get on the air. HollywoodChicago.com: You were a featured player in Spike Lee’s ‘Chi-Raq,’ which opened to mixed reviews last December. As a native Chicagoan, what do you think was most misunderstood about the film? Lennix: The biggest misunderstanding was the title of the film, which of course was controversial from the outset – and that was not a term that Spike Lee coined. It provoked the ire of the mayor and the city council, and admittedly the production stirred the pot of the controversy. Usually that type of show business publicity is not a bad thing, but the idea of a satire based on an ancient Greek play probably confused people, and they weren’t willing to give it a chance. In Chicago, it got the reaction of ‘that’s not my city.’ That’s about pride, and I admire that people would be defensive about Chicago. However, the intention behind the film was all good. We wanted people to be entertained, but we also wanted them to take a serious look – which good satire does – at the topic of gang violence through a ironic lens. And I think ‘Chi-Raq’ did that. HollywoodChicago.com: I asserted in my review that it had a ‘Dr. Strangelove’ tone to it. Lennix: I agree. And that was one of our models. In fact, I based my character of Blades on General Buck Turgidson [George C. Scott] in ‘Strangelove.’ George C. Scott is so superb, that I based my role on his in that film. HollywoodChicago.com: Once you were in production, did Spike listen of take any advice from his Chicago advisors? Lennix: No, he didn’t. [laughs] He went and made the film he wanted to make. HollywoodChicago.com: As a native Chicagoan, what has been your reaction to the Laquan McDonald controversy, and the continued violence that plagues the poorer neighborhoods in the city? Lennix: I don’t think it’s difficult to understand why these incidences keep happening. There are a lot of reasons behind it, but also the images that people see in the media of black people – whether journalistic or narrative – remain horrible. And those images, combined with the lack of respect among black people in the poorer neighborhoods for themselves, and the part the police and other people coming into those neighborhoods play, it creates no value for life. I think this is a direct result of no economic opportunities or infrastructure, and no concern or investment. In short, nobody gives a damn. This is the worst squandering of my life. We now have a black attorney general and an African-American president, who claims to be from Chicago, and they don’t give a damn. While the president is separate from the legislative and judicial branches, he does have unique executive power. He could be bringing to bear more pressure on the legislative arena. HollywoodChicago.com: Do you think there is a double standard for the killings in Chicago versus elsewhere? Lennix: If this were happening in Crawford, Texas, or Kennebunkport, Maine, or Hope, Arkansas, you’d better believe that the sitting president would say something or do something. Along with the mayor, it’s all been lip service. HollywoodChicago.com: Well, just to counterpoint, I believe that Barack Obama has faced an unprecedented amount of legislative opposition and just plain bigotry, just by being president and being a darker skin tone than other people in this country. Lennix: I recognize that, and have heard it. Here is why I think it is a specious argument. One, is that he had a majority in both houses of Congress his first two years in office, and he squandered that political capital on a feckless healthcare bill, which in my opinion will go down the tubes in its current state, and has done nothing to control costs. It’s helped some, but it’s also hurt others. Secondly, he was elected twice. Since he was not running for reelection, he could have done something, but I’ve observed he’s done nothing. The opposition will always be there, despite his color, and his life was also not typical of the African American experience in the United States. HollywoodChicago.com: Speaking of which, I recently read ‘Dreams From My Father,’ the autobiographical portrait of Barack Obama before he exploded into the national consciousness. Since you knew him that community organizer, back in the day, what do you think has been taken away from him as a individual during his meteoric rise? Lennix: He lost any sense of accountability for the people who launched him into that position – in my opinion, it’s an appalling dereliction of duty. And whether or not he is the president for all people, there are still a group of people who have been suffering for 400 years in this country. If he is going to be the president of all people, then dammit, be the president for all the people. Don’t just be the president for one special interest group one day, and another the next day, but never for the one that is most in need of his attention and his loyalty. I really can’t wait until the next president, because at least the community-at-large will hold their feet to the fire when they are in office. They won’t feel they’re taking the person down who is there now, who is one of ‘ours’ and has it so tough. It is the most powerful position in the world, and whether or not he was opposed during that time, when he is out of office, he won’t have that power any more. What damn good will it do then? HollywoodChicago.com: I picture a day when you’ll get to sit across from him, and hopefully you will express this all to him. Lennix: Yeah, I’m happy to tell him any time. He knows my phone number. Obviously I haven’t been secretive about it. The World Premiere of “A Small Oak Tree Runs Red” runs through July 3rd, 2016, at the Anthenaeum Theatre Studio Three, 2936 North Southport, Chicago. Featuring Ronald L. Conner, Tiffany Addison and Gregory Fenner. Written by Lekethia Dalcoe. Directed by Harry Lennix.